Is this her original face? All the Gabors seem to have erased their past from the history. Well, the few lies Zsa Zsa carried along, like being an opera singer in 1930s?? and then failing to sing on a TV show in the 60s, lol. Eva was my favorite - ZsaZsa was obnoxious. She can be funny, but woe to any man who marries her. OH MY GOD. She's still alive. How can this be?? Wasn't she on her deathbed being fed by IV like 5 years ago? twitchy2.0 and Clubber Lang like this. i always confused zsa zsa and eva. which one was on green acres? and what did the other one ever do besides hollywood squares? and do we know for sure that they are two different people? did they ever appear in the same place at the same time? Eva was on Green Acres. She reminds me a bit of Kate Winslet in the top photo. 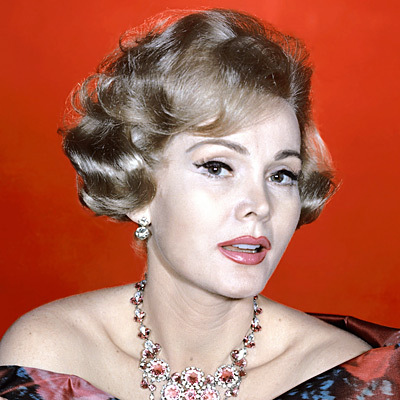 How many rings around Zsa Zsa Gabor's tree?